If you trade a USB external drive between Windows and Mac operating systems, you will notice a few additional files when connected to Windows but not when connected to Mac. 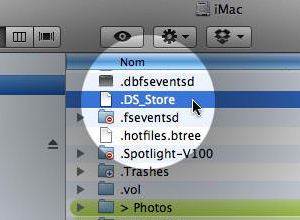 Files such as the .DS_Store, .Trashes, and other starts-with-a-dot files leave you wondering whether you need them or not.Worst case – you might find these files in almost all the folders you’re trying to copy from Mac to Windows. Of course you can manually delete these files, but it starts to get annoying beyond a certain point. What you need is an automatic way to get rid of these files. MacWorld’s OS X Hints section suggests modifying the default umount script, such that it automatically searches and deletes any traces of Mac-only functionality from drives when they’re ejected or unmounted from the Mac. It takes a small bit of Terminal work, but the results could help get rid of the annoying issue of having to deal with the .DS_Store files. Every new OS version update will wipe out this change. This method will wipe out other types of hidden files as well (named with a period as their first character). Try out this method and let us know if you have any issues.